Another weekend, another con. This weekend it's Phoenix Comicon and one of the bigger publishers on-hand will be Dark Horse (booth #7052). Exclusives will include Archie vs. Predator #1 Phoenix Comicon exclusive variant cover by Darick Robertson (500 copies) and there will also be tons of Dark Horse comics, graphic novels, art books and collectibles. Dark Horse talent will also be on-site for signings and panels. Full press release, signing and panel schedules below. Visit Dark Horse Comics at Phoenix Comicon at booth #7052 for free swag, such as comics, buttons, posters, and more! Check out our show exclusives, signings, and panels, too! Archie vs. Predator #1 Phoenix Comicon exclusive variant cover by Darick Robertson (500 copies). A set quantity will be available at opening each day of the show. Limit of 5 per person per day while supplies last. Each comic is $5.00. Archie vs. 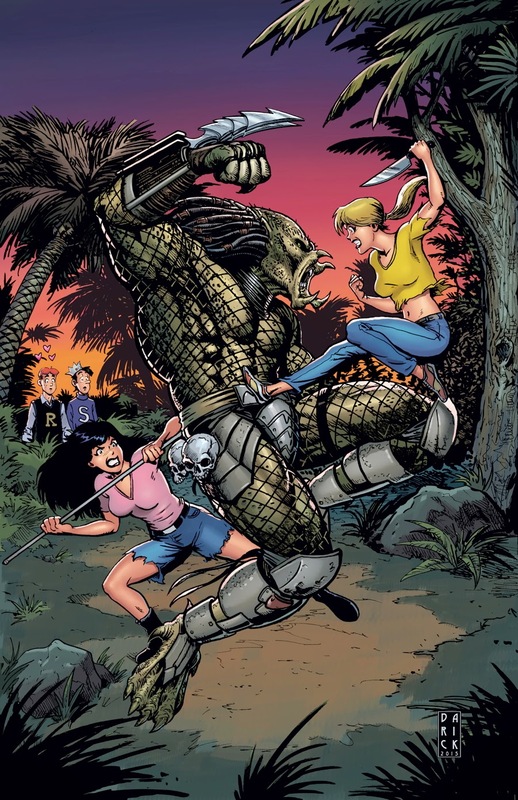 Predator #1 Phoenix Comicon exclusive variant cover by Darick Robertson available for purchase. Please join us at the panels below, brought to you by Dark Horse Comics and friends! Please visit http://www.phoenixcomicon.com/programming for more panels featuring Dark Horse creators, as well as guidelines for attending panels. 12:00 p.m.–1:00 p.m. North 121 Dark Horse Comics! For years, Dark Horse has brought the creations of the most talented creators in the comics industry to the stands—and now’s your chance to jump onboard! Join Dark Horse PR coordinator Steve Sunu as he heads up a panel of Dark Horse’s incredible creative talent, including Rafael Albuquerque (EI8HT), Paul Cornell (This Damned Band), Alex de Campi (Archie vs. Predator, Grindhouse), and more! From The Umbrella Academy and Casanova to Daytripper and De:Tales, Eisner Award–winning duo Gabriel Bá and Fábio Moon are two creators at the forefront of innovation in comics and graphic novels. With their newest anticipated graphic novel, Two Brothers, coming soon, join the twin brothers for a special spotlight panel discussing their careers, the joy of creating comics, developing Two Brothers following their incredible success with Daytripper, and much more. Rafael Albuquerque is the Eisner and Harvey Award–winning co-creator of Crimeland, Mondo Urbano, and the New York Times best-selling series American Vampire (written by Scott Snyder and Stephen King). Come find out what Rafael is up to next!